What is Thanksgiving without those delicious desserts that we all crave after the turkey has been cleaned and the stuffing is enjoyed? Overeating at the main course never dampens our appetite for the seasonal desserts that “fill in the cracks”. Zinn has recently experienced a shift in food preparation as a result of a staff member who has mastered the art of gluten-free baking and another individual who consumes gluten-free goods. We have had the privilege of enjoying gluten-free pumpkin bars and birthday cupcakes that were absolutely delicious and baked to perfection! Since Zinn has fallen in love with gluten-free products, we have decided to share these holiday recipes published by OPRAH Magazine! As referenced by OPRAH Magazine’s article “18 Gluten-Free Desserts for Thanksgiving Everyone Will Love“, these delicacies are sure to fool even the most refined tastes. The dishes are simple to prepare, give detailed instructions on which flour substitute to use, and they have already been tested by families across the globe! Unless you spill the beans, no one will guess that these are gluten-free! With these recipes, you can face the in-laws with confidence, surprise your spouse, and be showered with compliments at this year’s Thanksgiving table! This loose custard is quick, easy, and obviously delicious! You can get creative by using different toppings and a wide variety of cups and jars to give this dessert that touch of “you”. This cold custard is the perfect balance to a hearty thanksgiving feast. Best of all, you can make this dessert the night before!! Share a taste of central Pennsylvania by making this creamy cotta with fresh farm milk! What better way to bring your relatives a taste of home than this Panna Cotta thickened with buttermilk and topped with tart berries? After the rich and savory tastes of Thanksgiving dinner, cleanse your palette with this sweet and zesty cold custard. Explore the savory side of dessert with this torte featuring cherries, almonds, and bittersweet chocolate. Your family will love this cake so much, it will become another integral part of the holiday traditions. The savory taste of this cake comes from a variety of ingredients like vinegar, rum, brandy, sour cherries, and toasted almonds. Leave the traditional fruit cake at home and bring surprise with this chocolaty delight that is appropriate for all ages. If you are pressed for time around the holidays, make it ahead (this cake can be refrigerated up to three days before serving)! Are you looking to make your Thanksgiving a little more elegant this year? When family and friends gather for a feast, it is fun to break out the china, crystal, fine silver, and the aged wine. Why not finish the dinner with the refined elegance offered by this dessert? 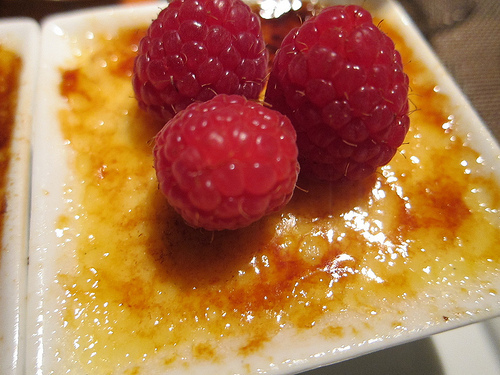 Crème Brûlée is classic, fun, textured, and can be decorated appropriately for any occasion. The hard sugary top offers a stage for all sorts of décor and trim without breaking through to the creamy layers below. Unlike other recipes, this dessert requires prep time immediately before serving and cannot be prepared a day ahead. While it does take more time, this is well worth the extra effort! These are a basic coconut based cookie that pairs well with any main course! It can serve as a dessert, a sweet side, or even an appetizer. These simple yet delicious vanilla macaroons can be built up and accessorized with fruits, chocolates, mints, salts, and caramels. The crunchy and flakey texture pairs perfectly with holiday beverages like mulled cider, hot cocoa, and warm sangria. Have a happy, healthy, and Gluten-Free Thanksgiving! Author Unknown. “18 Gluten-Free Desserts for Thanksgiving Everyone Will Love.” OPRAH Magazine. Harpo Productions Inc. 23 Nov. 2015. Web. 23 Nov. 2015. <http://www.oprah.com/food/18-Gluten-Free-Desserts-for-Thanksgiving>.